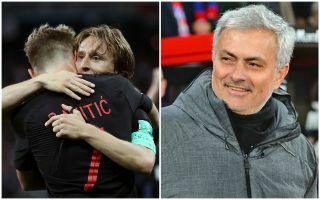 Manchester United are reportedly the favourites to complete the signing of Real Madrid and Croatia midfielder Luka Modric this summer. The 32-year-old has had another superb season at the Bernabeu before strutting his stuff on the international stage in the World Cup finals with Russia. Modric’s side will now play in their first ever World Cup final this weekend as they take on favourites France, who are chasing their second final victory. There’s no doubt United could benefit from the qualities of Modric in the middle of the park after he outplayed England’s midfielders with a masterful display in this week’s semi-final clash. The Croatia international may be edging towards the end of his career, but remains a class act and hard-working professional who’s showing no signs of fatigue despite a long and gruelling club season and now World Cup tournament performing at such a consistently high level. The Manchester Evening News reports that he is now just 7/4 to move to Old Trafford this summer following some talk that he could leave Real Madrid this summer. CaughtOffside understands Modric would likely cost around £60million to sign from Los Blancos, who still value him highly, and who do not want to lose more big names after selling Cristiano Ronaldo to Juventus this summer. This shouldn’t be out of United’s price range, however, with the club reported to still be in the market for new midfielders after Michael Carrick’s retirement, with Paul Pogba struggling for form and Ander Herrera also possibly set to move on.